Lisa Rizziello is a Jeweler from Pennington, NJ, who uses her Premier business to bring hope and joy to women undergoing cancer treatment. When I started selling Premier Designs Jewelry, it was not only because I love the jewelry, but because I knew that Premier truly valued community service. I have had many family members and friends suffer with cancer. I know that while undergoing cancer treatments, they have to deal with so many stressful situations. I desired to develop a program to help cancer patients, to give them a small dose of happiness, even if it was just for a brief moment in their wearisome day. Selling Premier has allowed me to fulfill that desire. About two years ago, I started the “Sprinkling Hope with a Touch of Bling” program at the hospital where I volunteer. Patients undergoing treatment get to pick out a piece of jewelry for free; I use 25% of my proceeds to purchase the jewelry. Since Premier is so generous to their Jewelers, it allows me to fund my program easily. They always respond with such happiness and gratitude, and sometimes tears. It’s a very moving time for both of us as we choose their jewelry piece. Even though the idea is to give something to them, I feel truly blessed to be able to spend time with these very special and courageous ladies. 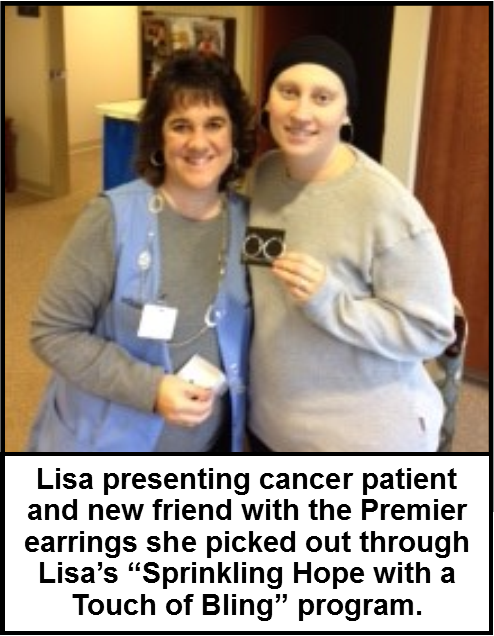 This is what Premier is all about – just a beautiful story. Thanks for sharing! I think this is awesome. I lost a dear friend to cancer and have been wanting to start a program like this to give back to these patients but didn’t know how to get it started. Would love more info on how she started. What choices do patient have in jewelry? what about the guys that are taking treatments? I just completed my reconstruction after having a double mastectomy back in November. This story made me so happy that Lisa is making these women feel beautiful! This is an inspirational story for what Lisa has done. This is truly rewarding. 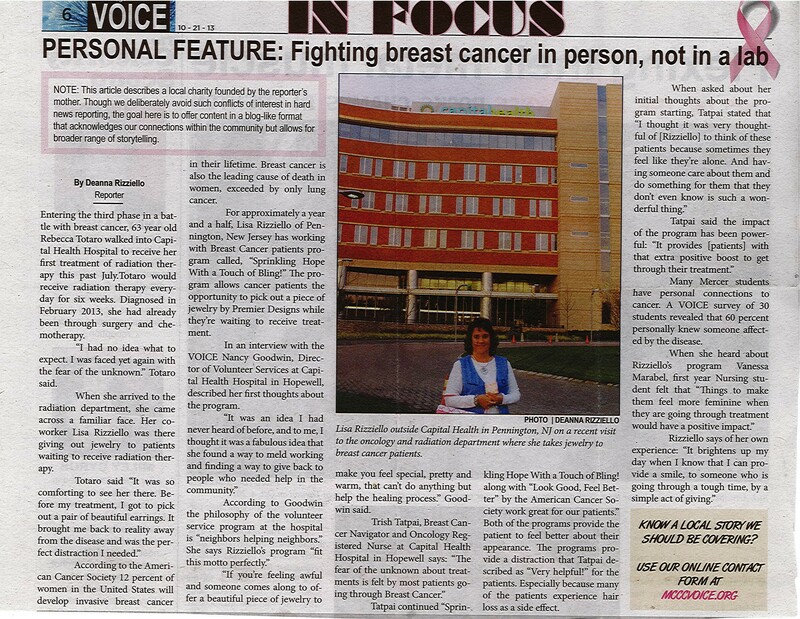 My mother is a 8- or 9-year breast cancer survivor (first person in the family). My best friend is a 2-year breast cancer survivor. They are both tough cookies and don’t let their lives to be ruined. That’s how their lives stay strong and still going. Positive thinking and doing something will be helpful despite of dealing with all chemos, radiations, pills and so forth. I hope I can accomplish to set up of doing something to give the community back. I have two different goals that I would love to give something back – breast cancer organization and one other. Lisa, thank you for sharing this with all of us but most of all, God has given you this opportunity and use you to do this! I love this story! I love to hear about the passion behind the “WHY” Premier Designs! I have been working for Premier since January, but have been a volunteer for the American Cancer Society for ten years…this is inspiration of how to combine 2 passions of mine! Thank you for all that you are doing! Lisa is a very special woman! It is so heart warming and inspirational what she does for these women. I myself have been touched by breast cancer and Lisa has been a wonderful friend and ray of light for me. Sometimes its very difficult to feel pretty while undergoing breast cancer treatments and Lisa helps remind you that you are a beautiful woman and deserve to feel that way!